WHAT IS THE USA CREDIT SYSTEM? HOW WILL MY DEGREE BE GRADED? Degrees in the United States: what is the credit system and how will my degree be graded? For international students, the structure of university courses in countries that are not their own might seem confusing. In the United States, which is one of the most popular destinations in the world for international students, degrees are awarded based on a system of credits. 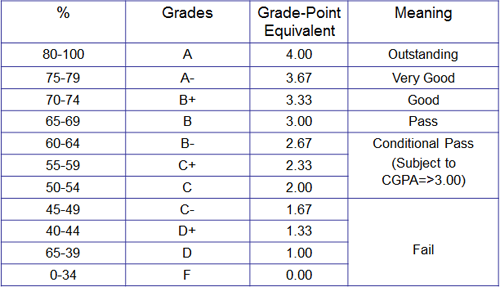 Here, we explain what a “credit” is, and how it is used to award grades to students at universities in North America. A credit is a unit of study, of which a specified amount makes up a course. So for example, one course may take up three credits. The number of credits that are required to make one course may vary between subjects and universities. How many credits make a semester? International students need to complete 12 credits per semester in order to continue in their studies, but can take on more. And how many make a full undergraduate degree? Although your undergraduate degree at a university in the United States will in many cases be four years, really it depends on how long it takes you to complete the required number of credits. In general, working on the basis of 12 credits per semester, three semesters per year and four years per degree, and taking into account exam periods, an undergraduate degree would require the student to gain around 130 credits in total. How many credits are needed for a postgraduate degree? Depending on the particular postgraduate degree that you choose, you could be expected to complete between 30 and 64 credits throughout the course. How are degrees in the United States graded?